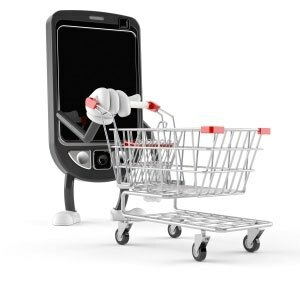 M-commerce applications : Shop from your smartphone ! M-commerce dominates the digital age as a reference also to meet the specifications of certain products and services, and to compare prices. In fact, 88% of consumers search online before they buy in physical stores according to a study by marketing agency DigitasLBI. 64% of these digital consultations are made from desktops. However mobile devices also play a part in this. For example, 46% of consumers carry this out this operation through their smartphones and 20% for tablets. Theses statistics are proof that consumer purchase behaviour has changed considerably. Most of these inquiries are made during journeys in public transportation or when you have a free moment. That is made on the go, and in places of passage, therefore the presence of the smartphone is very significant. In the sense, the boom means mobile applications m-commerce. For many businesses, having a mobile app means being more accessible to potential purchases. The simplicity and the possibilities offered by this method of mobile commerce allow access to that potential market through the development of m-commerce applications where thousands of users will be available to browse through your shopping catalogue anytime and anywhere. Along with the increase in adoption of smartphones , so do m-commerce applications. In the same study carried out by DigitasLBI, a survey reveals that at least 26% of users have made a purchase via smartphone in the past 3 months. We can even go further by examining the data. 72% of Spaniards believe that m-commerce application will increase the traffic of people in physical stores. Out of this large populations, 75% carryout actions through an m-commerce application. This has become very popular in todays world and has been adopted by large corporations like Amazon, EBay and numerous magazines and supermarkets. They way to do business is rapidly evolving thanks to new technologies. The market for mobile devices is booming, and with it grows the need of mobile app development. Including m-commerce applications. At Yeeply, you can find developers to carry your idea; we help you create your m-commerce app for your business and open new possibilities for this growth.